Could changes in university funding limit student places? Universities will have to offer fewer places if cuts in tuition fees are not replaced by government money, say leading research universities. A funding review of post 18 study is expected to be published next month. 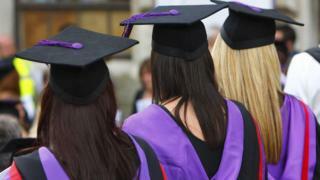 The Russell Group, and seven charities, want ministers to rule out an overall drop in funding. The government says job prospects and drop out rates are as important as fair access. An independent panel, led by Philip Augar, has been asked to look at whether the current system offers value for money for students and taxpayers in England. Tuition fees are now the main source of funding for universities. Universities receive £9,250 a year per student, up front - to meet teaching costs. The Russell Group of research focused universities argues that some courses will close if tuition fees are cut, and not replaced with taxpayer funding. Colin Bailey, the Principal of Queen Mary University in London, says they break even overall on the cost of teaching home students under the current system, but if tuition fees were reduced that would change. "We would have to reduce our places, because there are only so many courses you can run at a loss. "Therefore there would be a de facto cap on numbers. There will be some courses which would be under pressure." Universities already receive top up cash from the government for courses that are very expensive to teach, such as engineering and medicine. That is likely to continue whatever the panel recommends. Universities are worried about potential tuition fee reductions in subjects such as English, history or languages, which might not attract a government top up. In a statement backed by seven charities that help low income students into university, the Russell Group says a reduction in places could lead to fewer students from poorer backgrounds getting places. "The more privileged students will get the places, because some of the poorer students may not get the three As or have the same family support", says Colin Bailey from Queen Mary University. Anand Shukla is the chief executive of Brightside, one of the charities that has also signed the statement. "We are concerned that if a cut to tuition fees leads to an overall cut in university funding, then efforts to improve social mobility will go into reverse. " These arguments are likely to face a strong push back from the government, which has ruled out any cap on numbers. Ministers may also point to recent data on graduate earnings. While a degree from a high profile university, such as those in the Russell Group, can lead to a significant increase in how much you earn - that's not the case across all universities, or degree subjects. The figures published last year suggest that a third of men are going to universities which have a negligible impact on their earnings by the age of 29. In response to the Russell Group's joint statement, the government says there are now record numbers of disadvantaged students and the review is intended to make sure there are no barriers to going to university. The Department for Education said: "We need the access and participation work done by universities to ensure all parts of society have fair access." "But participation also has to mean successful participation and that means focusing not just on admissions but on progression, dropout rates and ultimately employment." The Labour Party is committed to getting rid of tuition fees and funding universities directly. Angela Rayner, the shadow education secretary, said: "A small cut in tuition fees with no replacement in funding would be the worst of all worlds. "Students will still face tens of thousands of pounds of debt and those with low incomes would see no benefit at all." "Meanwhile, universities will see a sharp cut to their funding, which could create a crisis in the sector". Tuition fees are the most politically contentious issue being considered by the review panel, but its remit is far wider. Further education colleges in England have been the most cash starved part of education under successive governments, and are also pressing for a rethink on their funding.